Blackened salmon does not mean that the fish is burned!! It actually refers to the slight charring of the spices, not the fish, which gives the fish a smokey, spicy flavour. Don’t overload the salmon with too many spices as you still want it’s flavour to shine through. To make the couscous, add the boiling water to the couscous in a large bowl. Cover and leave to rest for 10 minutes. Add in the rest of the ingredients, season well. In the meantime mix together the spices to make the coating for a Salmon. Coat the salmon all over with the spices and then transfer to a barbecue, cook for 15 minutes until cooked through, turning once or twice. To make the lime dressing, mix all ingredients together and chill until required. Spoon some couscous onto a plate and sprinkle with some fresh mint. 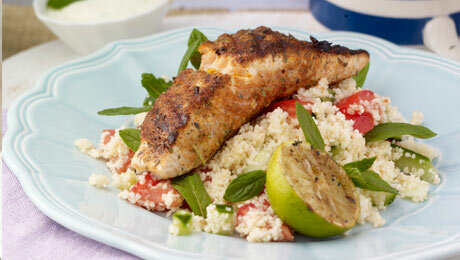 Add the blackened salmon on top of the warm couscous and drizzle with the yoghurt and lime dressing.